money to pour into skateboarding. And with the global crisis looming over our heads, it’s refreshing to see a company willing to invest in the mainstream sport of the next decade. So, currently Bucky Lasek, Pedro Barros, Andy MacDonald, Alex Perelson, Sandro Dias and Rune Glifberg are in for the game. The Pantech Crossover Athlete Award works only for Dew Tour participants and will be given to the skateboarder with the best cumulative score in two disciplines. All athletes competing in two Dew Tour disciplines are eligible. For skateboarders competing in three disciplines (street, vert and bowl), only the scores from their top two disciplines will count toward the award. At the end of 2011, after all contests are over, the skateboarder with the highest score will be honored during an awards ceremony at Las Vegas. ﻿ Bucky Lasek is allegedly the one currently leading the Pantech Crossover Award. Bucky Lasek is great at everything he does, whether it’s racing go-carts, playing lawn darts, or color coordinating his gear. The only obvious thing that the undisputed king of the Dew Tour vert ramp is terrible at is losing. Some see Lasek as an obvious choice for the pole position since he has been dominating multiple skateboarding disciplines for decades. However, we do not want to play down a brother, but Bucky Lasek has not done a lot of contests this year. He landed third in Bondi. 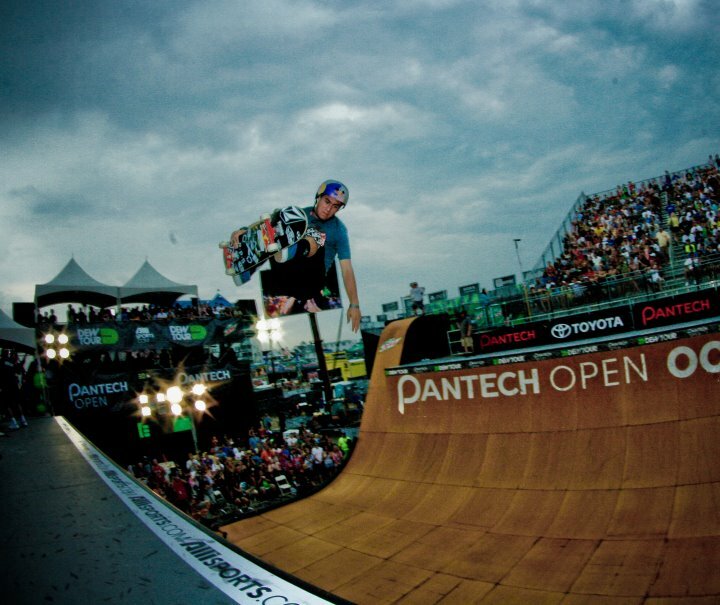 At the first Dew Tour stop in Ocean City, Maryland, he won the Skateboard Vertical competition and came in at a solid second in the Bowl competition behind Pedro Barros. And that's it... His second win came as no surprise because he has Heaven, the world's largest personal bowl in his backyard. That kind of exclusive backyard access leaves lots of time for practicing, not that he needs all that much practice time to begin with. 2011 is definitely Pedro Barros’s year and he might well be the Pantech champion: he started the season by winning both Bowl-A-Rama (in Wellington , New Zealand and in Bondi, Australia) in January. He landed second at the Florida Bowl and third at Kona, Florida. Then, he won the sumptuous Pro Tec Pool Party in front of Rune Glifberg, Andy MacDonald, Nolan Munroe and Alex Perelson... He also managed to come in third in the huge bowl at the Copenhagen Pro 2011 in the park division. This summer, not only did he take the bowl at the first Dew Tour stop, but he also landed fourth in vert. And just last week, he finished 2nd at Coastal Carnage in Huntington Beach in front of several thousand people. Yeah, so many contests, so little time… Brazilian Bowl Powerhouse Pedro Barros destroyed the competition at Dew Tour’s first skate bowl event with his massive transfers, 540 variations, style around the corners and unbelievable speed proving that bowl riding is definitely his cup of tea but the Carioca is also not so bad in vert, that’s ingrained in his genes…. Of the remaining four skateboarders up for the Pantech Crossover Award only Andy MacDonald made it to the first Dew Tour stop's top five finishers in the bowl competition. Alex Perelson and Sandro Dias made it to the preliminary skateboard vert final jam landing in 8th and 9th positions respectively and Rune Glifberg landed at the 7th place during the first Dew Tour stop's preliminary bowl final jam round. But things will change after this week-end when we know who are the new winners of the Dew Tour in Portland. Photos copyright Dean Tirkot, Grant Brittain, Lee Leal. All pictures published with the author's permission. All rights reserved.